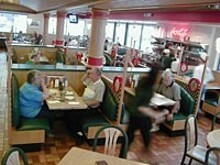 A perennial Metro Times Best of Detroit winner, National Coney Island has taken its success to a new location in Macomb Township. Several varieties of garden-fresh salads are available, as are sandwiches, gyros, Mexican and Greek specialties and award-winning Coney Island-style hot dogs. Hamburgers and chili are also served. Vice president Tom Giftos recommends their Coney dogs and the grilled chicken salad. July is National Hot Dog Month; to celebrate, the restaurant is offering a $2.99 special which includes one Coney dog, fries and a large Coke. Drive thru available.